SRIC is a non-profit religiously sponsored organization headquartered in San Antonio, Texas. Institutions and individuals belonging to SRIC work to balance their economic policies and practices with their fair and social concerns. As investors and shareholders, members act to influence corporations toward social responsibilty. On April 28, Fr. Seamus Finn was a panelist at the annual Socially Responsible Investments Coalition Annual Event held at the Oblate Grotto Ministries Center in San Antonio, Texas. The discussion panel on current events was titled “Care, Climate and Cash.” It included Alyssa Burgin, founder of the Texas Drought Project, who spoke about specific consequences of climate change in Texas and around the world, as well as Donna Meyer of CHRISTUS Health who spoke about the recently passed health care bill. Fr. 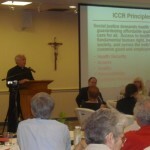 Seamus also talked about responsible investment in the light of Pope Benedict XVI’s encyclical “Caritas in Veritate”. 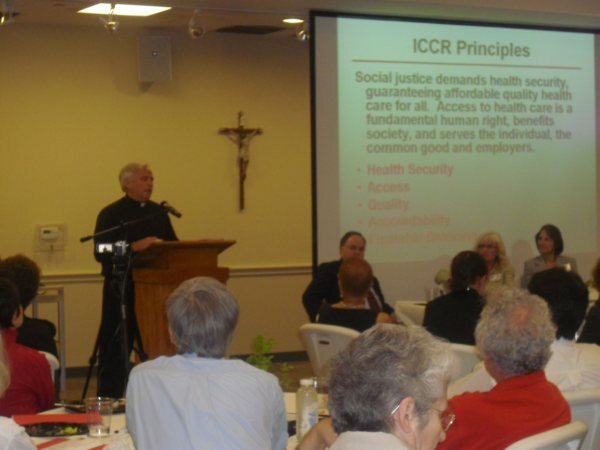 As most of the 100 plus members of the audience were members of Catholic religious orders and church activists, the articulation of the moral, spiritual foundation of work for financial reform and other socially responsible investment work was much appreciated. Fr. Seamus ended with a plea to broaden our thinking and awareness so we see that actions taken in the world of finances and investments have implications not only for people in the United States, but consequences for the entire world. Thanks to Patti Radle who supplied the material for this report. The financial crisis, health care and the urgency of responding to global warming were three criticial issues discussed at a recent panel organized by the Socially Responsible Investment Coalition (SRIC). The current crises were examined by a panel with varied expertise. Fr. Seamus Finn, OMI discussed the financial crisis, emphasizing its impact on the poor.